Item # 307473 Stash Points: 1,595 (?) This is the number of points you get in The Zumiez Stash for purchasing this item. Stash points are redeemable for exclusive rewards only available to Zumiez Stash members. To redeem your points check out the rewards catalog on thestash.zumiez.com. A good day of skating starts with a good pair of socks. 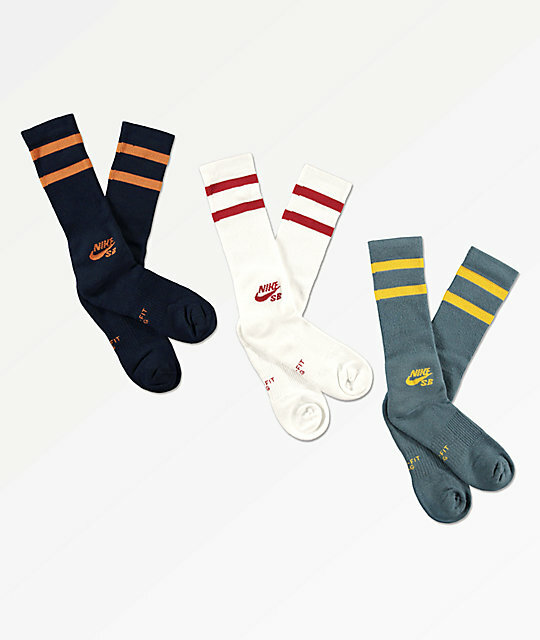 The 3 Pack Multicolor Crew Socks from Nike SB are a must-have addition to your sock drawer and daily looks. Coming in three different colorways, this pack of crew socks features maximum cushioned footbeds, ribbed elastic arch support, and Nike's Dri-Fit fabric for moisture wicking comfort. 3 Pack Multicolor Crew Socks from Nike SB. 3 pairs per pack: Light blue, navy blue, & white. Jacquard knit Nike SB logo with athletic stripes on the upper. Mid-shin crew length with elastic ribbed upper. Fits Men's shoe sizes 8-12 &vert; Women's shoe sizes 10-13. 40% polyester, 32% cotton, 26%% nylon, 2% spandex.